SavingStar offers a new way to save. Select the coupons you like and then use your grocery and drugstore loyalty cards at checkout and the money is added into your SavingStar account (your bill stays the same at checkout). You choose how you'd like to get your money paid out. The choices are a bank account, PayPal, Amazon gift card, or a donation to American Forests to help plan trees. 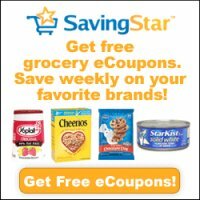 Now Redeem SavingStar Offers at Walmart, Target, Walgreens and more. You can save at almost any major grocery or drugstore chain - at over 42,000 grocery and drug stores throughout the country. Best of all you can also use regular coupons so you can maximize the savings. I do not like the fact that I need to enter my card number with the grocery stores I need to purchase from. I'd rather print the coupon and take it to any store I deemed that has the best pricing. love this website and i hope to get new coupons as using and it is hard to get the coupons from here at Glen Burnie Maryland. Thank u keep up great job. Great site. Have already redeemed twice. Love it.